If you live in Arizona, there’s a chance that you’ve probably heard of Last Chance. It’s a store in Phoenix that sells final-clearance, returns and overstock from Nordstrom stores. It’s basically the ultimate treasure hunt where you’ll either have amazing luck or no luck at all. To be sure, it’s not the loveliest shopping experience, but the feeling of getting a really great deal makes it all worth it! I mean, I got a $180 pair of Kork-Ease shoes for $22.98. I felt very accomplished. 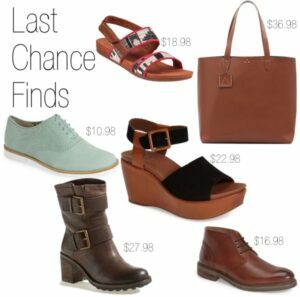 So, here are my top tips for shopping at Last Chance! 1. Go early and on a weekday. This store gets crazy. They re-stock throughout the day, but I feel like the earlier you go, the better. My top tip would be to try and avoid going after 3 p.m. Those times mostly attract those that are getting off of school and work and it tends to get most busy at that time. The weekends are another time I’d advise you not to go. I haven’t experienced it myself, but through word-of-mouth I’ve learned that the weekends can be quite crazy. 2. Try things on and inspect every inch. Keep in mind that there are no returns or exchanges at Last Chance. If you’re going to purchase something, make sure it fits! Another thing that’s important to do is to check over everything that you plan on purchasing. Odds are, it’s probably there for a reason beyond it not fitting or something like that. When I’ve gone, I’ve seen lots of stains and tears so you really just have to be on the lookout for those types of things and determine if they are something you can fix or not. 3. Stay hydrated and fueled. You can’t have food or drink inside, but shopping at Last Chance can be exhausting. Eat before you go rather than after so you have a more enjoyable shopping experience. 4. Be wary, cell reception is bad. It is literally a bargain basement down there, as in the fact that it is almost literally a basement. I can’t speak for others, but with Verizon I hardly have any service down there! So, you’re kind of on your own for deciding if you need something or not, by way of checking if your friends like it. So, bring along a friend to offer opinion! It’s really overwhelming to go through everything in the store looking for anything. I mainly focus on shoes and bags. Clothing, especially being plus sized, is pretty hard to go through. There was a rack that had some nice plus sized coats, but that was about all I saw that tickled my fancy. So, I personally focus, like I said, on shoes and bags. Just find what works best for you! If you go in well-armed, you can find some really great deals. Just don’t be discouraged if your first time isn’t fruitful!